John and I have been working to ensure that Berrien RESA has appropriate resources for all classrooms in our county. As such, we have added the Strawbees Creation Kit. This kit comes with enough plastic connectors and straws for your class to create all kinds of 3D structures. We first came across these at Maker Faire New York and immediately wanted to start building. What really got us excited was something called Quirkbot. Quirkbot is a small, arduino controller that you program to bring your Strawbees creations to life. Currently funded through Kickstarter, we are hoping to see it ship soon. Until then Strawbees offer plenty of potential on their own. 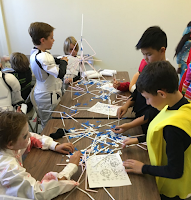 Here is an example of a recent classroom using the materials to create the tallest freestanding structure they could in 15 minutes (don't let the costumes scare you - it was Halloween party day!). We think they are a great tool to create shapes with in a math class, design a bridge to test in science class, or create a nest to keep your egg safe in an 'egg drop challenge.' We also had a great time combining them with other building and creation materials like Little Bits. As with our other resources you can check this kit by filling out the form linked on the #BRESA Resource Request page of this site.